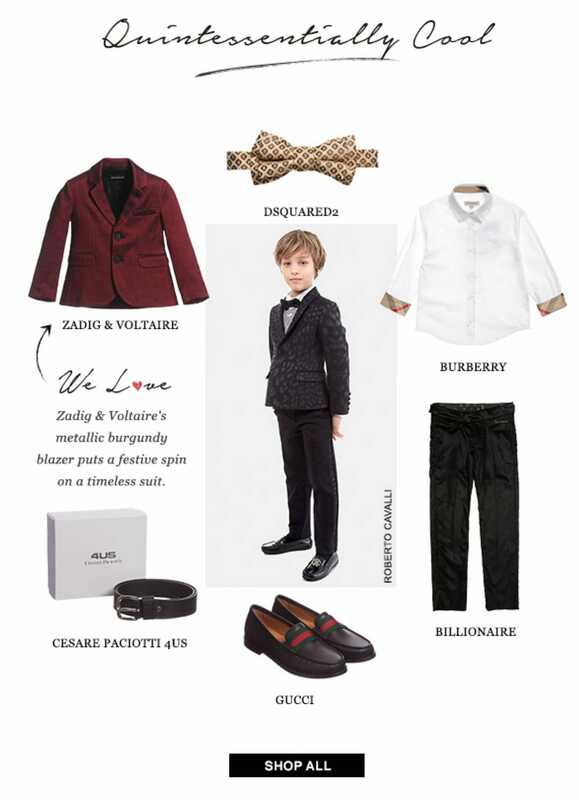 As soon as the whole outfit for special occasion is ready for your small gentleman, you probably would feel that something is missing, this small but meaningful detail might be a stylish looking bow tie, like for example the one by DSquared2. It is made of soft silk with all over embroidered pattern. Calm colors would look perfectly with most colors in your boy’s clothing. White shirts should be present in any boy’s wardrobe, as they contribute to creating a smart outfit in combination with classical trousers and jacket or stylish skinny jeans or trousers. Burberry long sleeved shirt is of classical white color, at the same time there is beige quad classic nova check on the sleeve cuffs and inside neck, adding style to the whole image. There is color matching logo embroidery on the chest. Blazer is considered to be one of the classical variants of special occasion clothing. Here we present a unisex stylish looking blazer by Zadig & Voltaire. Being of red color with silky metallic effect, it would serve a perfect addition to a shirt and trousers set for both boys and girls. Metal logo on the lapel matches the stylish classical buttons on the front. For those boys, who do not really like classical trousers, but still like to look smart and bright during their special occasions and holidays, there is a great option, offered by Billionaire. Super shiny trousers are made from a cotton and viscose mix. Gold embroidered logo makes a good combination with inside waist belt golden print. There is a possibility to regulate the waist width. The hems are unfinished in order to adjust the length perfectly. Belts are important accessories for men and women, for boys and girls. They help to make the image finished; they add special notes to every days outfit, as well as to special occasion clothing. Cesare Paciotti 4US presents here belt, which is very close to classical version, as it is of medium width and has usual metal buckle. There are no additional decorations, thus this belt could be worn with everyday clothing and be added to a special occasion outfit. Most children, as well as adult people, like slip-on shoes, they are easy to put on and take off and they are comfortable to wear, under the condition that they are made of soft leather. Shoes by Gucci correspond to all these demands and would make perfect addition to smart trousers and shirt set or on the contrary – casual outfit for every day.